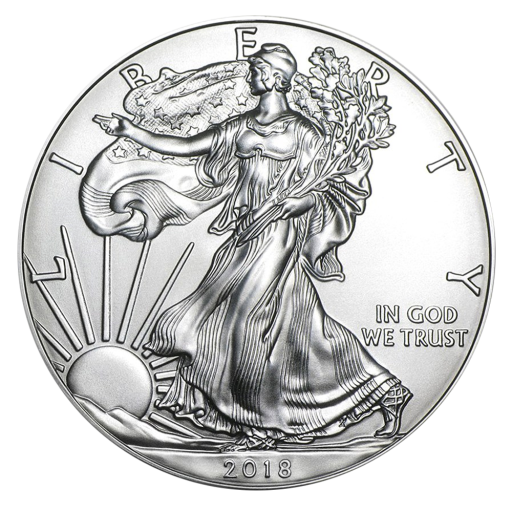 2018 1oz Silver American Eagle's are here. These highly-popular coins are chosen by investors who want to hedge against currency fluctuations or by collectors who enjoy the Silver Eagle's fine design details. The 1oz Silver Eagle is the official bullion coin of the United States of America. It is also the number one choice of buyers around the globe thanks to its exceptional tradability. The coin's face value of $1 is far less than its true worth and it is considered one of the safest options for both new and veteran investors. Often listed at just a few pounds, euros, or dollars over spot price, this unique silver coin is always in demand, and the 2018 American 1oz Silver Eagle is likely to be just as popular as its predecessors. Each of these beautifully struck 2018 1oz Silver Eagles contains one troy ounce of .999 pure silver. The coin was introduced for public sale in 1986 and over 400 million 1oz American Silver Eagles have been sold by the United States Mint since. The coin is also valued by collectors for its classic design details; the reverse shows John Mercanti's famous heraldic eagle with shield and 13 five-pointed stars motif, while the obverse features a revised version of the much-loved 'Walking Liberty' design by Adolph A. Weinman that was originally used for Walking Liberty Half Dollars issued between 1916 and 1947. Silver is considered one of the best bets for investors and 1oz American Eagles have been proven to perform well even during precious metal shortages. Their reliability and overall appeal has made them the first choice for discerning buyers of all ages and levels. CoinInvest is pleased to introduce the 2018 1oz American Silver Eagle. These sought-after coins are supplied singly, in tubes of 20 or in monster boxes of 500.